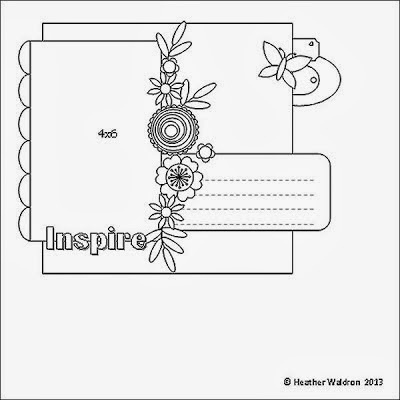 Bird is the Word has brought us another interesting challenge word this month - Inspire. I had started with a plan to use the sketch and some elements of it are still there but the page took on a life of it's own as it often does. 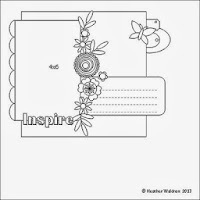 I was once asked what or who inspired me with my scrapbooking; I am far from a major talent in this craft but I continue to create because of the story the page tells. My answer to this question was 'My family', the men in my life, the women and children in theirs, my extended family and friends, my favourite places and the stories that belong to all of them. They are the inspiration that keeps me involved in this craft. I am also inspired by the talents, openness and honesty of others. I have explained in a previous post; You Inspire Me about meeting Heather Jacob, someone I was drawn to by her talent and a shared story of grief. It is interesting that I have titled this page in the same way; it is about meeting Becky Fleck of Pagemaps fame. I can't remember how I came to learn of this great website but I do remember buying her first book and not only looking at the pages there but reading some of the journaling. Her page about losing her faith after losing her friend to cancer really spoke to me and I emailed her. We conversed in this way for a couple of years including the period when I lost my eldest son in an accident. Becky announced a trip to Western Australia in that same year and I contacted her in the hopes of meeting her. She and her lovely husband were very generous with the time they spent with me and I will never forget their compassion and kindness. After you had her book signed for me it's the first place I go to when I need a sketch. Gorgeous layout! You showcased it so well with all those beautiful embellishments. so glad you joined us at Bird is the Word! This is really lovely Susan, I love the papers you have used and love the layers under the photo, great photo and I really liked the story behind the photo too.. and thanks so much for joining in at BITW too!